Posted on October 24, 2016 at 10:00 am. On Friday, my daughter tried to be helpful. Unfortunately, she was helpful by cleaning the downstairs bathroom, the one that the cat uses. More on this later. Since finding out about my chemical contact and sinus allergies, we removed all allergenic cleaning products from our home, EXCEPT one. My husband felt it was very important to use a household cleaner with bleach to clean the cat’s bathroom. He was so angry and adamant about keeping it, even though we both knew I was allergic, that I agreed it could stay for use in only that one room. About three weeks ago, we had to do some upstairs toilet repairs, and against my wishes, he brought the cleaner upstairs. The smell spread throughout the upstairs, even with closed doors, the window open, and the fan pulling the air upwards through the bathroom and out of the house. We washed the fabric shower curtain and the bath mat and wiped the floor and counter. Since then, I have been experiencing sinus problems, rashes, and eye reactions. Fast forward to Friday. Not realizing how it should be used, my daughter sprayed that same cleaner all over the floor so heavily that the scent was everywhere, more strongly than before. It didn’t help that the furnace fan recirculates air throughout the house at regular intervals. I told her to stop using it and clean it up, and then went outside and hid in the van (because it was cold and I still don’t have a safe winter jacket) until my husband came home from work, tossed the cleaner, and started to clean out the house. I was near tears. This time everything needed cleaning: every exposed soft surface, all the hard surfaces, throughout the home. You see, a scent in the air means chemical molecules in the air, and these molecules settle on every surface, including your own skin and hair, soft furnishings, tables, chairs, couches, etc. After that future contact with those surfaces can provoke further allergic responses. My husband was furious about the needed cleaning – as furious as he had been about the thought of giving up the cleaner to begin with. He asked why I hadn’t gone behind his back and thrown it out anyway if it was so bad for me. All I could say was that I was trying to respect the sacrifices he’s made thus far in making changes in life related to my allergies. He had been so angry that I was more willing to take the health risk than to upset him more. Since the weekend-long cleaning, I’ve been feeling better than I had since the first bleach cleaner incident. My sinuses aren’t acting up as much, and my skin isn’t as irritated. Granted I’m still waiting for the magic two to three day window to pass before the big reaction hits, and medicating regularly to try to prevent it, but I’m more comfortable than I’ve been in a month. From now on, liquid castille soap will be used to wash the floor in the cat’s bathroom. If soap is good enough to clean poop off of hands, it’s good enough to clean it off of a floor. Sometimes it takes a crisis to bring on the required action. Sometimes that crisis also tells us something about ourselves, like the need to stand up for our health and our bodies, regardless of peer pressure. Tell us about a crisis point when you needed to stand up for yourself and your allergies. What happened? What did you do? Comment below. 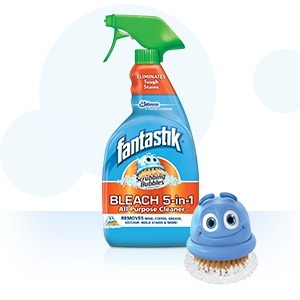 So what were the chemical allergens in that fantastik product? It might be helpful for many to have a better understanding of exactly what allergens may be in that? Thank you! I’m not sure. I failed to take down ingredients, or even the name, before it was thrown into the garbage, unfortunately. I was in a state of mind in which I wanted nothing to do with it. You have just described my life. It is nice to know i’m not the only “Hyper allergic to every darn chemical and fragrance in every product sold in regular stores” and “had to quit my job because of it” person out there. 🙂 Have you browsed Terra20? I’m in Ottawa and I shop there a lot but they also do online sales. TONS of chemical free, fragrance free products. Thank you so much for your comments! I love hearing that my struggles can help others – we shouldn’t all have to discover how to cope with our allergies in isolation. So often doctors tell us to avoid our allergens (if they even bother to figure out just what those allergens are) and then send us on our way. There’s a huge gap between hearing those instructions and living comfortably. I hadn’t heard of Terra20. I tend to stay away from most commercial body and hair care products, other than pure soaps. I’ve had too much trouble with everything I once thought was safe for me, and making things myself gives me the ultimate control over their contents. They do appear to have some interesting kitchen and children’s items though. I may check it out the next time I’m up that way.